The use of bait has often proved to be effective during cod fishing from boats, and there is a wide range of baits to choose from. Both live bait such as ragworms and dead bait such as mackerel and shrimps are used as bait in saltwater. Some knowledge about this type of cod fishing will increase your opportunities to achieve some great catches. Bait fishing offers excellent opportunities, but also a few challenges. Which bait to use will be an important choice that should be influenced by several surrounding factors. There are many types of bait that have proven suitable for cod fishing. When selecting bait you have to, among other things, take into account what's available at the present time of year. You must also decide whether to buy bait or find it yourselves. Some types of bait will be easily found, while other types will often require you to put down a lot of work. The simplest way is of course to buy bait from a tackle shop. The quality will, however, often be questionable when buying live bait. The vast majority will be able to provide their own bait, something that is recommended. For many anglers, this is also an important part of the experience. Cod fishing is not an exact science, there is no right or wrong and everyone does things a little differently. Most anglers have their favorite bait and argue that this is best suited for cod fishing. When selecting bait, you should listen to the many well-meaning advices with a bit skepticism. Instead of using other people's favorites, you should determine your own. Try to determine the fish's natural food supplier in the area where you are going fishing. If you engage in cod fishing in an area where cod are chasing herring or small coalfish, this will obviously be the bait you should use. More on Sea fishing baits. Locating suitable areas will always be important. In the article cod fishing spots, you will find information about this challenge. Bait fishing you can engage in from an anchored boat, as well as from a boat that is drifting. The most common alternative will in most areas be bait fishing from an anchored boat, but also when drifting bait has proven very successful. There are many methods and opinions available when you are rigging your equipment. However, strictly speaking you don`t need to spend much time doing this. A simple solution works very well for most fishermen. Let the fanatics spend their time setting up their gear, while the rest of us enjoy the actual fishing. Attach a sinker at the end of your tippet. The weight must be adjusted in relation to depth and current conditions. Then attach one or two leaders above the sinker using a 3-way swivel. At the end of the leader you attach a hook that is adapted to the size of fish you are chasing. The distance between the sinker and leader, as well as the length of the tippet should be determined by bottom conditions. Rough bottom conditions meaning that longer distance is needed. When all your equipment is good to go and the boat is anchored at a suitable position, it's time to start fishing. Cod fishing is known as a typical bottom fishing, so the sinker should lowered down to the seabed. Patience is important during this type of cod fishing, and you will often have to wait a while before the fish bites. Especially if you use bait that submits a lot of scent, you should show great patience. As the scent spreads in the water it will attract cod towards your bait. Take note that cod can smell bait at a distance of several hundred meters. Cod Fishing from a boat that is drifting means that slightly different requirements are set on bait fishing. You should still be adapting your sinker to the conditions and you should still fish along the bottom. The actual fishing you should however, vary more. Change between fishing with no movement and using long, smooth jigging motions. During this type for the cod fishing, it is advisable to use bait that sits firmly attached to the hook. A strong scent is not as important when cod fishing from a drifting boat. This is partly because the boat will be moving away from the “scent track”. Bait fishing is both exciting, as well as effecitve, meaning it will often provide you with some great catches. Do you lack the patience for such fishing, or maybe you are unsure of the methods? Then a good alternative is to attach bait on a traditional jig. This has often proved to be a successful method and also it is an easy way of bait fishing for cod. You simply attach chunks of bait on the hook below the jig body. Preferably you should use bait that sits firmly on the hook. Shrimp and mackerel are ideally suited. The last possibility is to replace the suspension, if any, that are used. Replace the artificial bait you are using with hooks intended for bait. More tips can be found in the articles cod fishing from boats and jigging. Also feel free to read about Fishing for Trout. Jigging is an easy way of cod fishing, which nevertheless has proven highly effective. This is a method that is suitable for most people, as well as in most areas. The main benefit you get from using boats is freedom of movement. The opportunities to seek out good fishing spots will usually be a lot better than during shore angling, something you should take advantage of. Feel free to read more about choosing cod fishing spots. Cod fishing from boats is often done by letting the boat drift freely. This means that the weather and tides will control its direction and speed. Placing the boat properly in relation to which way it is moving will be essential. Let's say that the tide is moving the boat toward the north. The boat should then be positioned on the south side of the actual fishing spot. By doing so, the boat will be brought across the fishing ground and thus allowing you some efficient cod fishing. Once you've drifted past this spot, you should move the boat back to where you started. If the fish don`t bite, you should choose a new starting point. If you drifted across the middle of the fishing ground in the first the run, try a bit further out toward the edges the next few drives. The purpose of jigging is finding fish, meaning that the entire ground should be fished efficiently, if necessary. If you lack local knowledge or if you are looking to find some new fishing spots, it can often be a good idea start at a random location. Choose a location that looks to be suitable, based on the draft and if available a depth sounder. Then it is really just to get your cod fishing started. Let the boat drift freely while hoping for the best. The opportunities for good catches are often smaller at this form of cod fishing, but the opportunities to find new fishing spots will in many ways makes up for this. When you catch fish, you should mark the location on your draft, this for future reference and use. If conditions are very calm, this form of cod fishing may be difficult. If the boat does not move, you will not be able to effectively fish new areas. How fast the boat is drifting will be an important factor during Cod jigging. The fishing equipment and especially the jig/pirk, must be adapted to these conditions. If there is a strong tidal current you will need to use heavier jigs in order to fish effectively. Areas that are located in shallower water will often be preferable under conditions that provide a lot of drifting. Cod fishing in really deep water will often require that boat is moving relatively slowly. This type of cod fishing is quite easy. The jig, also known as pirk, is lowered to the bottom and then worked up and down in a fashion known as jigging. If you are jigging during strong tidal currents, you may want to take a few breaks from the jigging motions. The current will then cause the jig and the suspension to move and thereby fish effectively. The use of suspension is recommended during cod fishing, with the possible exception of the pursuit of really big fishes. Attach 2-4 suspension with approximately a foot between them. Be aware that cod fishing mostly take place close to or at the bottom. Cod is a typical bottom fish and it is only when it hunts large shoals of prey fish (usually herring or small coalfish) that it moves into higher water layers. Cod fishing from an anchored boat, jigging may also be very effective. Many of the same premises will apply for such cod fishing, but you will be able to select jiggs more freely. As long as the boat is stationary, you will not need such heavy jigs in order to fish effectively along the bottom. If you are engaging in cod fishing from an anchored boat, active jigging will be important. Jigging is an easy and commonly used method. You can engage in this sport fishing in depths ranging from twenty up to several hundred feet. Especially at smaller depths close to shore, this is a type of cod fishing that is suitable for the entire family. Often you will find that other species are caught during Jigging. Feel free to read the articles Cod fishing - Lures and Jigs and Cod fishing rod. Cod fishing from boats, you can practically engage in at any given time. In most areas you will be able to fish all year round, as well as around the clock. However, there are some periods of time that are particularly suitable for cod fishing. The best period for cod fishing is from early October until April throughout. However, you can experience great catches even during the rest of the year. Many fishermen complain about small catches during the summer, something that is often caused by the fact that cod moves into other areas. This species prefers cool water, so when the temperature reaches its peak in the summer, it will seek deeper water. Cod fishing further from the shore will therefore offer the best opportunities during the summer. Feel free to read more about cod fishing spots. All of hours are suitable for cod fishing from boats. The exception is cod fishing in shallow water. If you seek areas where the water is no deeper than 40-50 feet, bright sunlight could complicate fishing. Especially in areas containing clear water, night fishing will then be the best option. Tides will affect cod fishing in several different ways. Local conditions vary widely, and these will determine whether it is best to fish at high tide or at low tide. The movements created by the tides will affect cod's food supply, and if you are cod fishing inshore you will often find the best fishing on the rising tide. Tidal water will then lead food towards the shore and the cod will follow. During cod fishing further from the shore, it will generally be preferable to avoid spring tide. When engaging in jigging, it is common to allow the boat to drift freely. Wind conditions and the tidal water will then determine the boats movements. Periods of strong tidal currents should be avoided during jigging, mainly because the boat then will move too fast for you to fish effectively at the bottom. Local conditions will always have a decisive impact on what time of year, as well as on what time of day cod fishing will produce the best catches. You should always take this into consideration when you are planning a fishing trip. My recommendation is nevertheless that you try cod fishing whenever you feel like it. Even in areas containing shallow and clear water, it will be possible to catch cod during bright and warm summer days. Although you can`t expect the biggest catches, often the joy by the fish you catch will be especially great. It will always be satisfying to catch fish during difficult conditions. Cod Fishing from boats are many fishermen's favorite, and it is often in this manner the largest fishes are caught. One of the major challenges is locating the fish, something that also applies when you are using a boat. 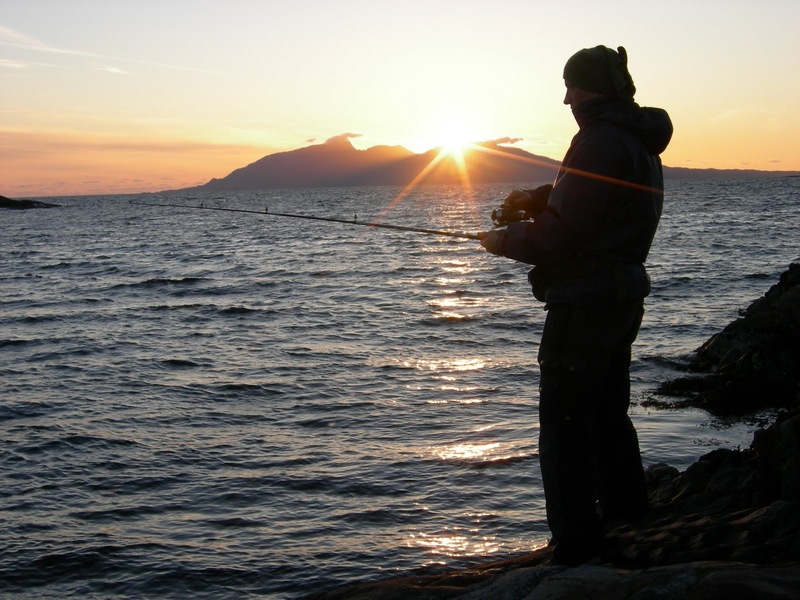 Here are some tips that should enable you to find some great cod fishing spots. In all sea and coastal areas where cod is present, you will be able to engage in cod fishing almost everywhere. Cod is present at many different depths, and you will find it both close to shore as well as far out to sea. Still some areas stand out as especially well suited. To locate such grounds, a depth sonar will be of great assistance, especially if you lack local knowledge. Large underwater reefs that are located in deep water will often prove to be excellent cod fishing spots. At such spots, a lot of the cod's natural prey will be gathered and therefore cod will normally be more than willing to bite. The same goes for areas where the seabed contains steep slopes/hillsides. At such places you can experience some fantastic catches especially at the point where the seabed flattens out. Wreck fishing is a well-known concept and especially in deeper water, wrecks will provide excellent opportunities for some great cathces. At such fishing spots cod will find lots of food while it at seeks protection in the wreck. Smaller underwater reefs will likewise provide good cod fishing spots. Well suited fishing spots can also be found in areas that contains rough ground. In such areas there will be lots of food and small prey fish, meaning that several species of fish congregate here. In areas close to shore, you will be able to experience good catches even in places where the seabed is even. In order to experience this, you should seek fishing spots that contains kelp. Cod will reside in such areas to hunt crabs, a favorite meal. When you are looking for cod fishing spots, you should keep in mind that this is a greedy fish. All areas, in which cod will find food, would therefore a preferable choice. As an example, it will often be located in and below large shoals of small coalfish or herring. Don`t be afraid to try tour luck in shallow water. In areas that provide good food supply, you will find excellent opportunities at depths from 20 to 50feet. Many anglers have experienced some incredible great catches in shallow water, especially during the winter and spring. You will almost invariably find cod in the vicinity of wrecks, rocky reefs, steep subsea hillsides, and in areas containing rough ground. Even lightly broken ground amongst an otherwise clean seabed will be enough to keep cod in this area. When you are going cod fishing, you should attempt to locate such locations. 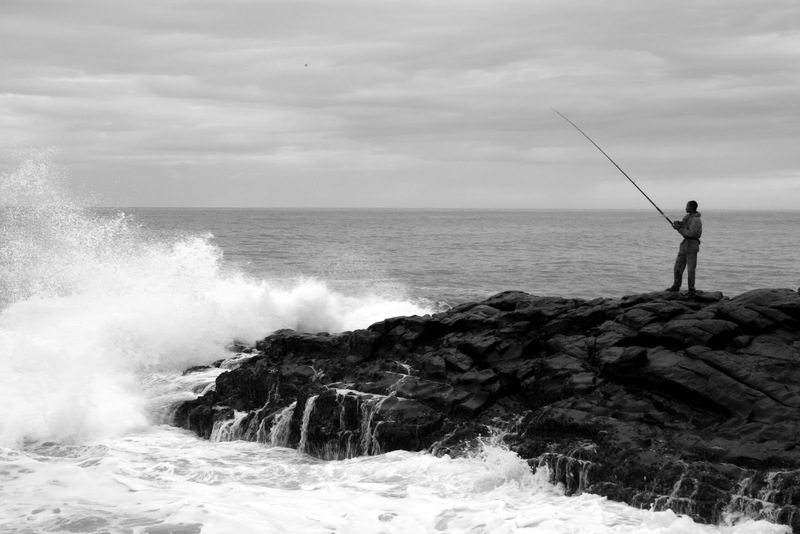 Casting will always be an important part of cod fishing from the shore. If you can`t cast your bait or lure into the area where cod are located, it will of course be difficult to catch fish. What requirements are set on casting abilities is primarily determined be whether you are using lures or bait, as well as of how far out at sea cod is present. 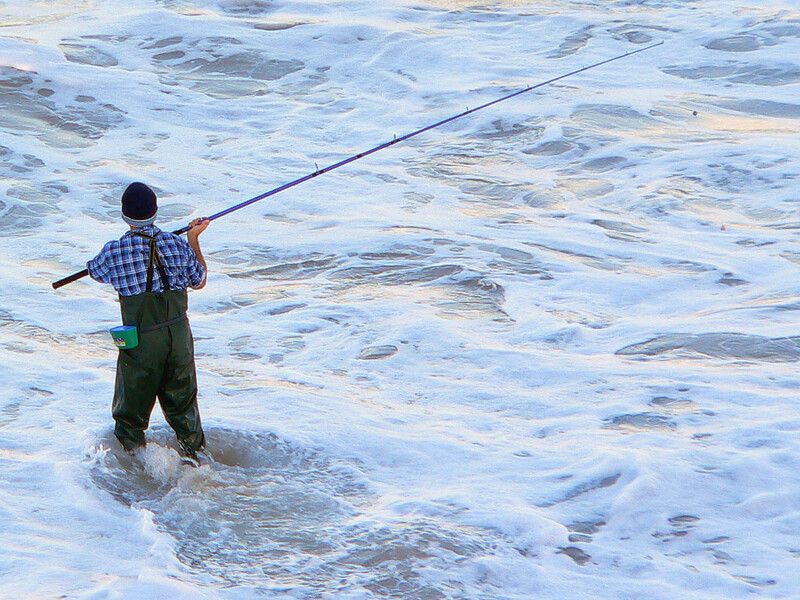 Bait fishing for cod will often take place at sandy beaches as well as at other areas with shallow water. At such fishing spots the fish will often be located a bit from the shore, meaning that you must be able to perform long distance casting. Large rods are usually necessary, and it requires a lot of training to achieve sufficiently long casting. Information on how to choose cod fishing rods. Seeking out areas where the water is deep close to shore, will often prove to be a good alternative for cod fishing, especially for inexperienced anglers. By fishing from a pier, sticking out from the shoreline, long distance casting will not be that important. Often, spin fishing will prove to be the best alternative for novice fishermen, and many experienced anglers also prefer this method. Shorter rods, providing fast action (elasticity) is preferable for this type of cod fishing. Long distance casting is an advantage even when spin fishing, but for beginners it`s easier to achieve this with the use of lures than it is with the use of live bait. During cod fishing from piers and similar fishing spots, you will often find that the fish are biting just a few meters away from you. The opportunities for great catches are therefore excellent, even for those who can`t manage the longest casts. Fly fishing is a demanding and challenging way of cod fishing. Good casting technique is of the outmost importance if you are going to try this type of shore fishing. Regardless what type of cod fishing you prefer, the opportunities to catch fish will always be present. Try to locate fishing spots that are suitable for your casting skills. Then you will have the best opportunities for good catches and thereby you will get the best possible experiences during cod fishing. Cod fishing from the shore is an exciting and rewarding form of sport fishing that everyone should try. To increase the opportunities for good catches, it will be useful to have some basic knowledge. In the article cod fishing spots, you can read about where to fish for cod. Now, you will get a few tips about when you should be cod fishing from the shore. In most areas there will actually be good opportunities for cod fishing throughout the year. Some fishermen may claim that they only catch cod at certain times of the year, this is incorrect. Often such opinions are caused by lack of knowledge on cod fishing. But although you can get good catches throughout the year, you will usually experience the best cod fishing from late September to April, throughout. Tides will often affect the conditions for cod fishing, and is thus a factor that should be taken into account. Local conditions are extremely crucial, and it is therefore difficult to give any general advice. In some areas there are huge differences between high tide and low tide, while in other areas there are only minimal differences. In general, the days before and after spring tides will provide excellent opportunities for cod fishing from the shore. The tide can also affect your access to the fishing spots. In some areas, low tide will prove an advantage, because you then can move further out from the shore. This will provide opportunities to reach fish that is present further out to sea. Elsewhere, high tide will be an advantage because cod are staying close by the shore. It will be adviseble to always check tide conditions at your fishing spots and also to seek information from (other) local anglers. Remember that even weak tidal flows could affect your cod fishing. This because such a flow often will affect the pray that cod are feeding on. Basically all hours are suitable for cod fishing from the shore, but there are some exceptions. If you are fishing in areas with shallow and clear water, it will often be best to go fishing between the time of sunset and sunrise. Sport fishing, sunshine and clear shallow water don`t mix well. Cod much prefers the cold water, so when the water temperature reaches its peak during the summer, it will move into deeper water. At night, however, cod moves back into shallower water hunting for food. Therefore "the dark hours" will often provide the best opportunities when you are trying for cod at this time of year. More about summer fishing. As you can see there are some things you can do in order to increase your opportunities for good catches during the cod fishing from the shore. But keep in mind that you practically always will be able to catch cod. Even on a warm and bright summer day, the cod can bite at the middle of the day. Never be afraid to try cod fishing whenever you feel like it. When you are cod fishing from the shore, the biggest challenge will often be to locate the fish. It may be a good idea to seek information from local fishermen, but some basic knowledge will to a large extent enable you to find the best fishing spots. The conditions along the seabed are usually the most important factor when choosing cod fishing spots. This fsih will often stay in places with rough bottom conditions, mainly because it will find food and protection in such areas. Therefore you should seek fishing spots with such bottom conditions when you are cod fishing from the shore. Deep crevices, seaweeds/kelp, steep subsea hillsides, as well as a rocky seabed will provide suitable conditions for cod fishing. Unfortunately, many fishermen will experience that they can`t catch cod, although they are fishing in suitable areas. This is usually due to casting at the wrong fishing spots. Many fishermen choose to fish in places where the bottom conditions are smooth and easy to handle, often out of fear of losing fishing equipment that could jam itself. This is a completely wrong approach to cod fishing. Cod is a bottom fish, and if you are looking for this species you must be willing to risk the loss of some fishing equipment. If you are cod fishing from the sandy beaches the cod will often be located in areas where the seabed slopes towards deeper water. Seek such fishing spots and you will experience good opportunities to catch this species. After a period of stomy weather you may experience great cod fishing very close to the shore. Storms will often bring food into these areas, and therefore the cod swims into shallow water. In general, beaches with a rough seabed or steep slopes will provide be best conditions for cod fishing from shore. If the beach also has areas of kelp, it is certainly an advantage. In some areas you will find the best fishing spots by staying away from sandy beaches. Here are some examples of areas suitable for cod fishing from the shore. Piers and other places sticking out from the shore will often offer very good opportunities. You will then have the opportunity to fish areas further from shore, areas which is usually unavailable when you are shore angling. Casting from rocks and small mountains will often prove to be successful. In such areas you can often find cod close to shore. This becouse it will find food and protection among a rough seabed with lot of kelp. Areas with rocks and small islets located close to shore, means rough bottom conditions and opportunities to experience some great cod fishing. In these areas you will also get many other species, such as pollack and coalfish. 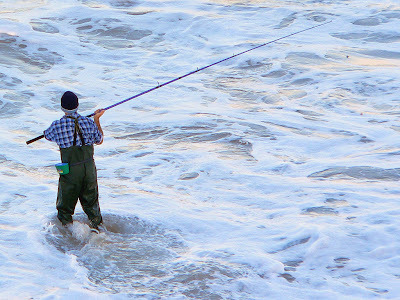 Try cod fishing when the waves beat against the coastline. In such situations, food is often brought up from the seabed, and this is a delight for many species. First and foremost, you should become familiar with the area in which you will engage in cod fishing. How the seabed appears is the most important factor when choosing cod fishing spots. When you engage in cod fishing, it is important to use suitable fishing equipment. Before you decide which fishing gear to buy, you should decide how you will be fishing for cod. You should also check out the fishing equipment you already have available. You will often find that it can be used for several kinds of sport fishing. On this website you will find tips and information about fishing equipment for all kinds of cod fishing. You will find advice and recommendations in a variety of price ranges. If you are to engage in shore fishing for cod, a fishing rod with good casting qualities is of the utmost importance, but be aware that to some extent there is big differences between bait and spin fishing. On these pages you will find advice on which fishing equipment that is suitable for the different kinds of shore fishing. Find articles that match the cod fishing you will try. When you are cod fishing from a boat, it is not as big a difference between fishing with and without the use of bait. There is however, slightly different requirements on the necessary fishing equipment also for this type of cod fishing. At which depths you are fishing should also influence your choice of fishing rod, reel, sinkers and bait. Advice on suitable and necessary fishing equipment for different types of boat fishing you will find on this website. Lures, jigs, spoons, soft bait and other fishing gear used in order to get the fish to bite, will also be reviewed in separate articles - Cod fishing - lures and jigs. The choice of such fishing equipment is often determined by personal preferences, but some general tips will be helpful for most fishermen. It is difficult, if not impossible to find a fishing rod and reel that are suitable for all sorts of cod fishing. But some rods and reels will be able to meet several demands. You will find suggestions for all-round fishing equipmwnt which covers several types of cod fishing, and in that way allows you to save some money. Don`t let high prices on fishing equipment prevent you from trying out cod fishing. For most types of cod fishing, it is quite possible to have success with relatively inexpensive equipment. Fly fishing is an exception, and you must expect to put in quit a lot of money if you don`t already have suitable fishing equipment. Some basic knowledge about codfish will improve your possibilities for great catches during cod fishing. Here is some basic information about this magnificent fish that is ideal for both sports fishing and cooking. Atlantic cod can reach a length of two meters and a weight of more than 100 lbs. It can reach an age of more than twenty years. Cod that weighs more than 80lbs have been caught on rod both along the coast of the U.S. and Norway. The British sport fishing record is currently at 58lbs. During cod fishing, it is not unusual to catch fish weighing above 20lbs, but close to coastline you should in most places be satisfied with catches ranging from 4 - 10lbs. Usually you will find codfish along the east and north coast of America and Canada, along the coast of Greenland, along the coast of Iceland, in the Arctic Ocean, in the Barents Sea, in the North Sea, in the Baltic Sea and in Skagerrak. The Atlantic cod can be separated into two main categories. One group lives relatively stationary along the coast, while the other group wanders more and is frequently found in deeper water. Cod prefers water temperatures from 0 to 20 ° C and if it gets too warm along the coast, it moves far out at sea into deeper water. It is the coastal cod that allows for cod fishing from the shore all year round. Along the coast of northern Norway you will find the best cod fishing spots. Fishermen from all over the world travel to areas around Lofoten in order to experience some incredible cod fishing. In these areas a lot of fish weighing more than 25lbs is caught and cod weighing 40lbs are not uncommon. In most areas there will be opportunities for cod fishing throughout the year. Some local variations there will always be, but generally it is during the winter and springtime that cod fishing is at its best. There are also local variations in the size of cod. If you try cod fishing from boats or cod fishing from the shore, you should examine local conditions. There is also a lot of useful knowledge to obtain from local fishermen. Cod fishing from boats is an exciting way of sport fishing, which is suitable for everyone. The opportunities for good catches are excellent and it is a relatively easy to learn. The really big fishes are usually caught during cod fishing from boats. Jigging is the most common method, but bait fishing for cod can also be very effective. Knowledge about fishing spots as well as techniques will always improve your chances for good catches. On these pages you will get information on cod fishing from boats that hopefully will increase your catch rate and thereby give you many excellent experiences as a fisherman. A successful fishing trip depends on using suitable equipment. How deep the water is, as well as how big fishes you are looking for, should determine which rod and reel you choose. The same applies for the choice of bait, spinners, jigs suspension and other accessories. Several other factors are also crucial when choosing bait and lures, something you will find information about in this article on cod fishing. As mentioned in the article Cod fishing from the shore, you will find cod in most areas of the sea. Usually it stays close to the sea bed, so it is mainly close to the bottom that cod fishing takes place. Several factors will influence where you will find the best conditions. On these pages you will among other things, gain knowledge about how bottom conditions, season and water temperature will affect cod fishing from boats. Jigging is a easy method to use when you are going cod fishing, but there is a lot you can do to improve your catch rate. You will find advice and information on both jigging and using baits. The same applies for wreck fishing. An angler with knowledge about the species, as well as the conditions which will apply, will get the best catches and therefore often have the most pleasant experiences. Take a few minutes to read the information about cod fishing from boats that is offered here free of charge. It will give you better opportunities for a high catch rate. If you prefer cod fishing from the shore, you will also find a lot of useful information on this website. You do not need to become an expert on cod in order to experience great catches, but some basic knowledge will make cod fishing more enjoyable. In the end that is the point of. It should be fun! 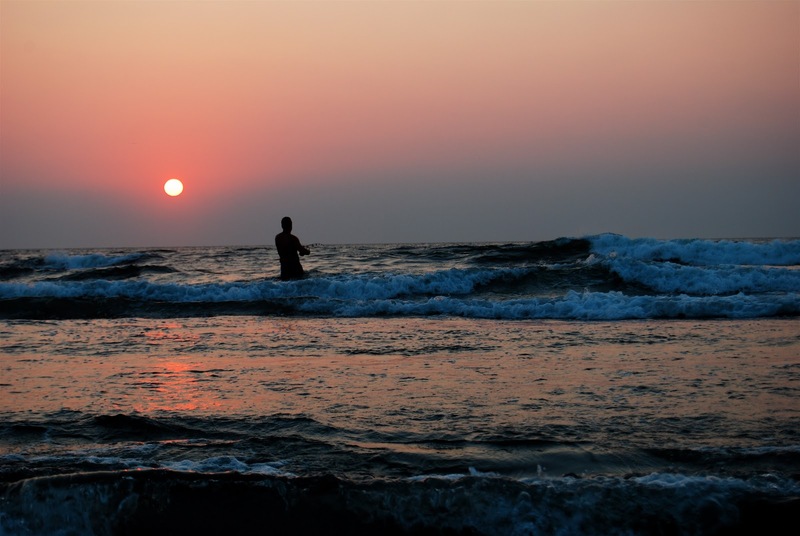 Cod fishing from the shore is a popular, as well as very accessible sport fishing. If you have access to saltwater, the possibilities for some great catches are often good throughout the year. This is free of charge in most parts of the world and the necessary equipment is not particularly expensive. Choosing the appropriate fishing equipment is important for all types of sport fishing. Although the equipment you need does not have to cost much, this also applies for shore fishing. Here you will find tips on selecting your rod, reel, line, bait lures and other accessories. Cod is present in most areas of the sea, often near the sea bed. 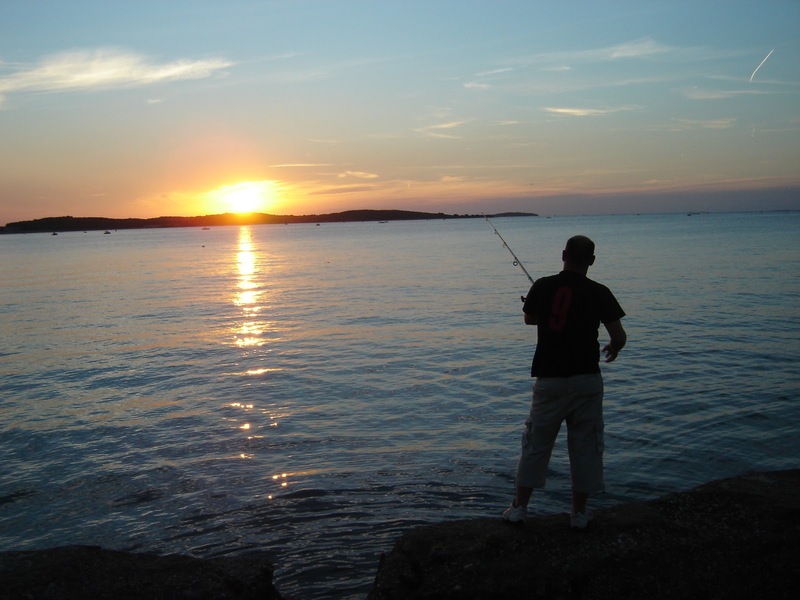 Some fishing spots are particularly suitable for cod fishing from the shore. Seasons, water temperature, time of day and weather conditions will affect where you will find the best spots. We will provide tips on how to choose suitable fishing spots during different conditions. You will also find tips and information on how to get the cod to bite. When you take part in shore fishing for cod, there are several methods you can choose from. Spin fishing is probably the most common and also the easiest way to go, but using bait can also provide very good catches. Some prefer fly fishing when they are looking for cod, a demanding but very exciting shore fishing. Choose your preferred method from the menu and get tips and advice that will help you to experience successful cod fishing. Sometimes conditions in the sea, seasons, water temperature and other factors affect your chances for good catches. Under such circumstances, you may want to try some other methods than usual. Read more about these methods, such as night fishing for cod, which has proven to give great results when the water temperature is high. Also feel free to read about cod fishing from boats. Whether you prefer cod fishing from boat or from the shore, some knowledge will give you a much better experience as well as a higher catch rate. Cod fishing is many fishermen's favorite. If you have access to saltwater, you should definitely try out this rewarding sport fishing. In most areas it is possible to engage in cod fishing throughout the year. Using boats is often effective, but you can also get good catches from the shore. The coastline with its beaches, rocky shores, reefs and piers provide endless opportunities for great catches. As long as you don`t need any expensive fishing equipment and saltwater fishing is free of charge in most places, you probably understand why cod fishing is popular. There are not many fish species that are this easily accessible to fishermen, and at the same time is highly valued as food. On this website you will find all necessary information about cod fishing. You will get tips and information on cod fishing from the shore, as well as cod fishing from boats. You will receive tips and advice on what fishing equipment to use. You will get tips and advice on where you should go cod fishing as well as how to get the cod to bite. Night fishing, summer fishing and wreck fishing for cod, you will also find information about. The same applies for Jigging, bait fishing and spin fishing. In short, you will get information tips and advice on all kinds of cod fishing. 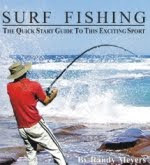 Both beginners and experienced anglers will find useful information on these pages. Use the menu in order to find the information you are looking for. Cod fishing is a fascinating and exciting sport fishing that we recommend everyone to try. Cod fishing is fun!